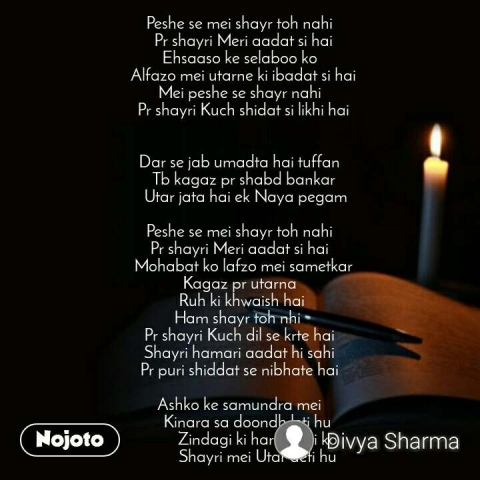 Discover & Read Best Stories about attitude shayri. 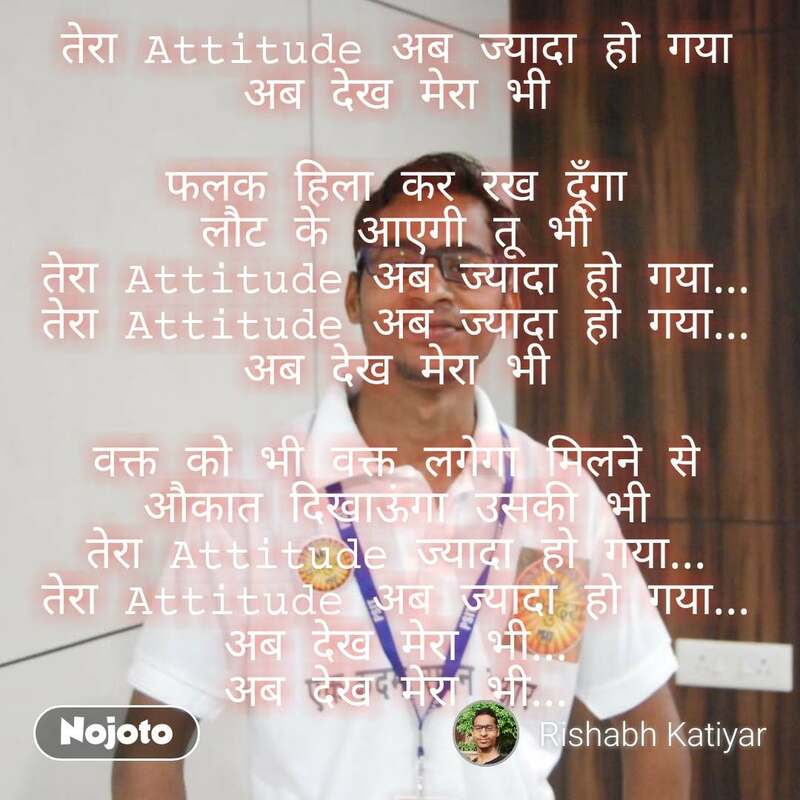 Also Read about status attitude, quote on attitude, quotes on attitude, shayri on dosti, attitude shayari, sad shayri, shayri in english, love shayri, shayri in hindi, shayri pic, shayri image, shayri ki dayri, love shayri in hindi, hindi shayri on life, shayri. 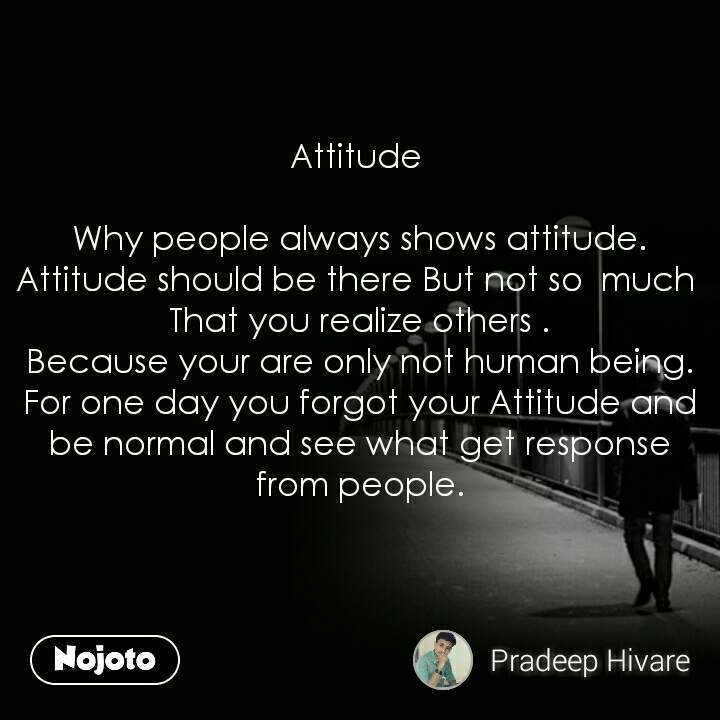 Why people always shows attitude. That you realize others . Because your are only not human being. 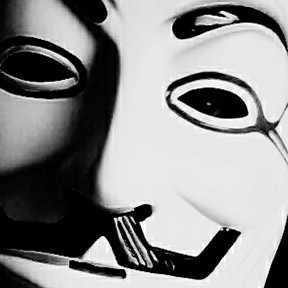 For one day you forgot your Attitude and be normal and see what get response from people. How can one become like Virat Kohli or big hitter of cricket ball like Chris Gayle? Very simple practice, practice and practice in nets, your aim would be to become very good timer of cricket ball. This is the first lesson in cricket, if you want to be a big hitter. However, if you want to be a hard hitter like Chris Gayle then it's a completely different ball game all together. Just follow how Virat Kohli did it from someone who was a orthodox touch player. First of all, Virat Kohli isn't God, he is just you and me like normal Indian, but then how he reached where he is - he was a chubby boy like most Indian kid, but with tremendous hunger to learn and willing to do anything(positive things) to be better than before is actually the key for him. Now, let's come to the most obvious thing, he has very good techniques. But many Indian cricketers are also have that who are struggling in domestic cricket and people generally consider them boring cricketer with limited potential for international cricket. Because there is some reality attached to that. One thing these guys have in common in India that they know how to play big innings. But they lack kind of fitness and mentality Virat kholi possess. Virat also was not that impressive in the beginning of his early career in domestic cricket despite his obvious success in under 19 cricket, but so did some others before him. What separate them from him- timing and hunger and absolutely no compromise attitude. 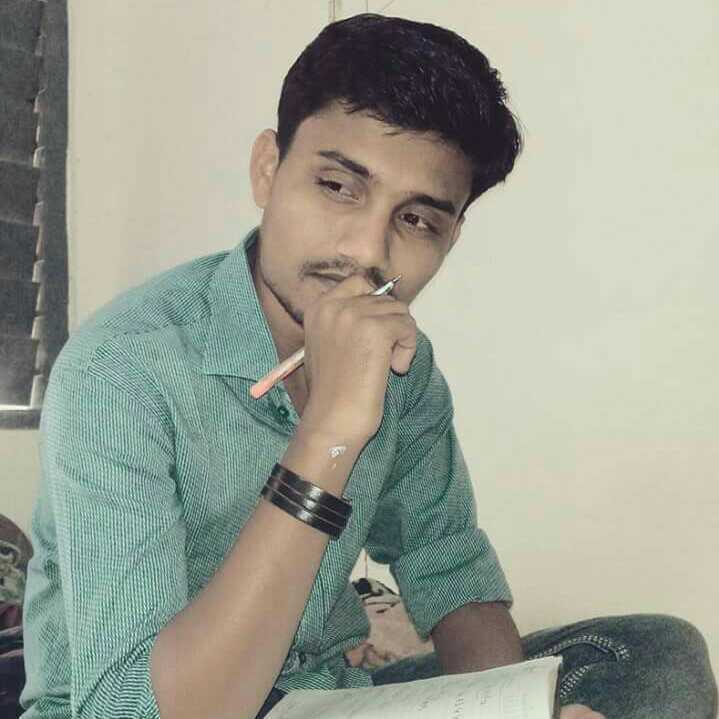 When he entered the IPL (which was at it's beginning too), he suddenly came into contact with the sport strengthening work out and also rise of the Internet helped. Most of the South African, Australian, New Zealanders, West Indian and English cricketers follow Base ball hitting strength-oriented workouts and that's why they hit the way they do. 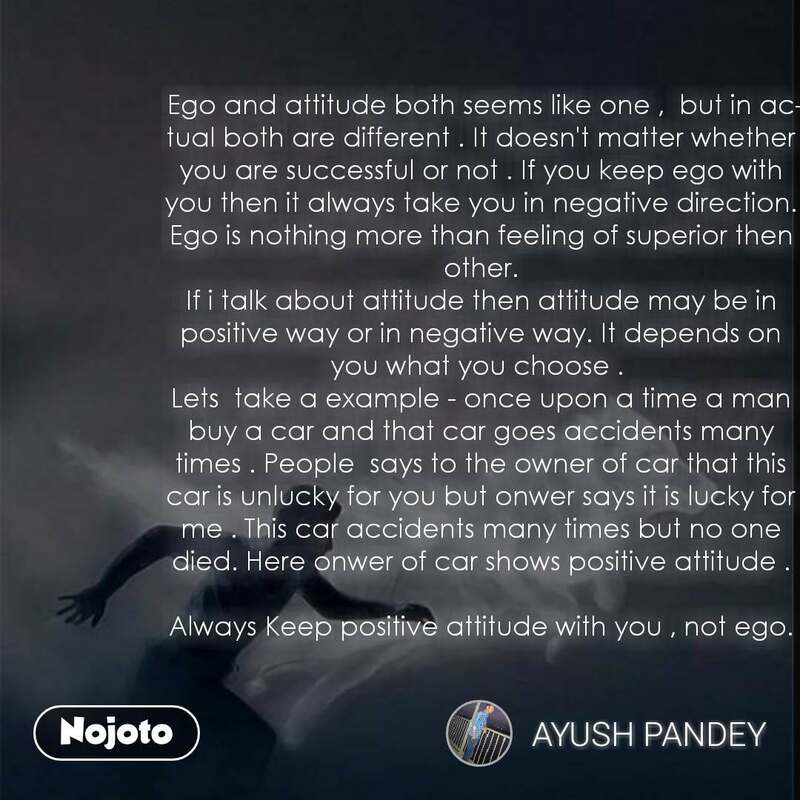 Virat learned all this faster than everyone because of his un put down - able attitude. He quickly realized what he needs to do to be a top quality cricketer who has the ability to destroy and also adapt according to the situation and also build innings(this is very important as this separates him from someone like Pollard). The workout ethics and international athletic diet helped him become more gritty than ever before and also very very strong in mind(which fuelled by his attitude). He wants to be best in the world and win everything that is in front of him, look at how he builds innings, no lethargy, he does what needs to be done, no matter how hard he has to work in the process. This is because of his international athletic training which every young Indian cricketer should do with absolutely no compromise attitude and don't forget not to be someone like Pollard. This is pretty much what makes Virat kholi what he is. You don't need to copy Virat kholi's stance and batting techniques. You can emulate(this is coming from a guy from Kolkata who has nothing to do with Mumbai or Delhi, so you can trust it is actually unbiased) Rohit Sharma's batting techniques too. I personally think he is an outstanding batman but the difference between him(even though he too is a very hard worker) and Virat is - Rohit doesn't possess that kind of ruthless mentality and willing to do anything to be perfect attitude. Virat now trained himself in such a position that he can train hard in gym even after scoring a hundred in one of days in a test match so that he can turned that into a double hundreds. That is what we called sports endurance in gym. Being a gym freak, let me tell you, anyone can be like that, but no one can teach you that Virat kholi type of attitude. You should be able push yourself in the correct manner to have that. You can follow UFC light weight fighter Jose Aldo's training and diet. Breakfast at 8.30am: 2 pieces of toast and a cup of coffee with milk. At 10.30am: half of a cereal bar. At 2pm: lunch is salad, chicken or fish. At 6pm: other half of cereal bar. At 9pm: salad with chicken or fish. Goes to bed at 11pm. 12 burpees with medicine ball. 5. 12 single leg squats (each and every leg). 7. 30 seconds planks (elbows). 8. 30 seconds planks (top of the push up placement). 9. Three 10 seconds sprints with 32 seconds rest in between. Other than the 9th one, every workout has to be done without the rest. Total 9 workouts are called 1st circuit. Relaxation for 1 minute and then repeat the next circuit other than only doing 11 reps for the 1st five physical workouts. Give the MMA workout program a try out and see if you can beat Jose Aldo's time of significantly less than 35 minutes. Good luck. This is how basically an athlete trains himself in gym. This video is about Baseball but it works for cricket too perfectly. This is a renowned baseball player who knows a thing or two about hitting, just remove everything that is associated with baseball and soak everything that is perfect for cricket because baseball and cricket are very similar except a few things. This guy is also renowned for giving strength hitting tips for baseball and again get rid of the baseball part and soak everything else, he has some valuable tips about what you(a cricketer) should be doing in order to be better at hitting and over all fitness, don't ignore anything, everything is valuable here. These guys are more general but follow their tips too. Last but not the least, this is absolutely top level athletic workout, this is excellent for your core.